Feedback form: send comments, critics and other feedback directly from the application! Cloudstock free becomes Cloudstock Full ad supported using admob. All features from the PRO version are available except upload/download folder as archives and edit ACL. 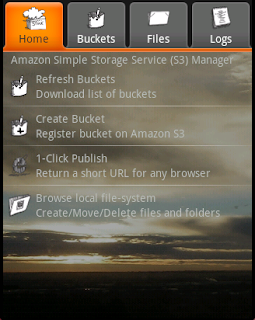 CloudStock is an easy to use Amazon S3 manager and file transfer client for the Android platform. CloudStock supports file transfer of arbitrary size, only limited by Amazon current 5GB cap, it also includes a file browser to manage local files. In an instant, push your photos, videos or documents to the world with the one click publish feature, supported for facebook, myspace, email or instant messages. CloudStock Free is already available on the android market, http://www.android.com/market/ or directly from your phone using the Android Market application.